Considering industrialization witnessed in Asia Pacific over the last few decades, the demand for industrial gloves has soared higher than ever. The region has emerged as a lucrative market for a majority of the leading manufacturers, as they target capitalizing on untapped opportunities across developing nations. Besides this, the fact that the leading players in the rubber industry are domiciled in Asia Pacific has catapulted the region at the fore of the overall industrial gloves market. As workers operating in the rubber industry are often exposed to hazardous environment, wearing industrial protective gears is imperative for them. Growth witnessed in the region’s rubber industry will therefore give significant impetus to its industrial gloves market. This also entails volatility witnessed in the demand for rubber will subsequently have a negative impact on the Asia Pacific industrial gloves market. Moreover, stringent regulations have compelled industries to invest in industrial protective gears, thus creating opportunities for the Asia Pacific industrial gloves market. 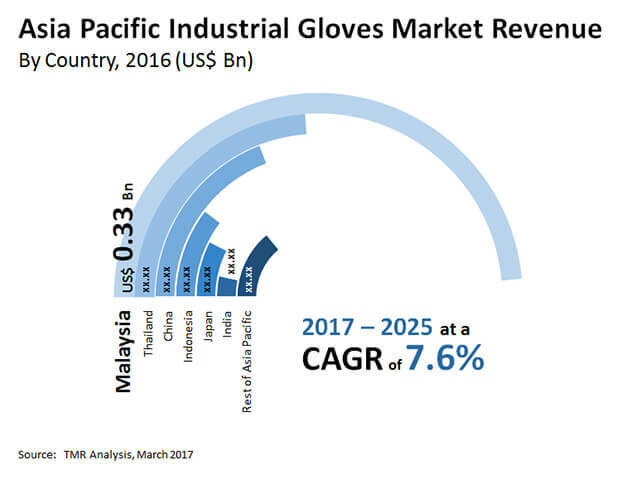 Exhibiting a CAGR of 7.6%, the Asia Pacific industrial gloves market is forecast to reach US$1.25 bn by the end of 2025. The market’s valuation was US$0.66 bn in 2016. Based on product, the dominance is expected to be with the disposable gloves segment through the course of the forecast period. It held nearly 75.4% of the Asia Pacific industrial gloves market in 2016. Manufacturing cost for the same is low compared to its re-usable counterparts. This is a key factor contributing towards the segment’s growth, as it allows producers to maintain a lower price point thus attracting a large number of consumers. Based on materials, rubber dominated the industrial gloves market in 2016 and is expected to remain the lead through the forecast period. Rubber gloves, also known as latex gloves are natural material which is made from rubber. Some of the key attributes of rubber gloves include its proper fitting, high level of touch sensitivity, good for wearing for a long period of time, durable against high-risk situations that involves infectious materials, cost effective, bio-degradable, and has a high level of elasticity among others. However, rubber has several adverse effects on human health such as irritant dermatitis, which is not considered extremely dangerous if neglected. It can cause cracks in the skin through which latex particles infiltrate, thus creating latex allergies on the individual. Delayed cutaneous hyper sensitivity is another effect caused due to extensive use of rubber/latex gloves which is manifested within 6 to 48 hours post exposure to latex particles. Due to these factors, this particular material is expected to lose demand in the future. Based on application, chemicals and pharmaceuticals accounted for the dominant share in 2016. Both industries are expected to maintain their respective positions throughout the forecast period. Workers in chemicals as well as pharmaceutical industries are exposed to hazardous chemicals and thus require high quality industrial protective gears. Also governments keep a strict vigil on these industries to ensure workers’ health and safety. Spurred by this, the market is expected to witness high demand for industrial gloves from chemicals and pharmaceutical industries. By country, Malaysia has emerged as the most lucrative market for industrial gloves in Asia Pacific. It held over 49.9% of the market in 2016. The country is expected to remain dominant through the forecast period. The flourishing rubber industry will support growth of the industrial gloves market in Malaysia in the coming years. Besides this, China and Thailand are expected to hold considerable share in the market. Industrialization witnessed in these nations will drive the industrial gloves market. Industrial gloves give insurance against heat, icy, chemicals, scraped areas, harm by erosion and maladies. They are used to ensure worker wellbeing and sanitary conditions in the environment. Industrial gloves market is witnessing a rapid growth on account of increasing applications across metal fabrication, oil and gas, machinery, aviation, automobiles, construction, healthcare, and food processing. Moreover, healthcare reforms and government regulations are some of the key factors driving the growth of the global industrial gloves market. The gloves are selected on the basis of span of the environment, occupation environment, and the type of conditions associated with the employment. Industrial gloves market is primarily driven by rising utilization of industrial gloves in chemical, healthcare, and food industry. Additionally, the growth of various end-user segments such as construction. Metal fabrication, mining, and automobiles has increased the need for industrial gloves in order to prevent any hazards in the workplace. Rapid industrialization along with rules and regulations enforcing the use of protective gears at workplace also give boost to industrial gloves market. Industrial gloves market is primarily comprises of disposable gloves and re-usable gloves. Increasing demand for disposable gloves is attributed to its low cost in comparison with re-usable gloves. However, re-usable gloves are used in several end use industries such manufacturing, construction, and oil and gas.